Frances Allan died on February 28, 1829, and Poe visited the day after her burial. Perhaps softened by his wife's death, John Allan agreed to support Poe's attempt to be discharged in order to receive an appointment to the United States Military Academy at West Point. Poe finally was discharged on April 15, 1829, after securing a replacement to finish his enlisted term for him. Before entering West Point, Poe moved back to Baltimore for a time, to stay with his widowed aunt Maria Clemm, her daughter, Virginia Eliza Clemm (Poe's first cousin), his brother Henry, and his invalid grandmother Elizabeth Cairnes Poe. Meanwhile, Poe published his second book, Al Aaraaf, Tamerlane and Minor Poems, in Baltimore in 1829. Poe traveled to West Point and matriculated as a cadet on July 1, 1830. In October 1830, John Allan married his second wife, Louisa Patterson. The marriage, and bitter quarrels with Poe over the children born to Allan out of affairs, led to the foster father finally disowning Poe. By the end of the year, Mr. Allan pulled Edgar from the University and after loud and spiteful fights with his foster father, Edgar left home and made his way to Boston. In 1827 he published his first pamphlet of Tamerlane and Other Poems. Out of money, Poe enlisted in the army as Edgar A. Perry at the age of eighteen, stating on the application that he was twenty-two. In 1829, after his beloved foster mother died, and although he was enlisted and over age, he applied to West Point military academy with the support of his commanding officer and foster father. When Poe dropped out of the army, John Allan promised to assist him in enrolling at West Point. 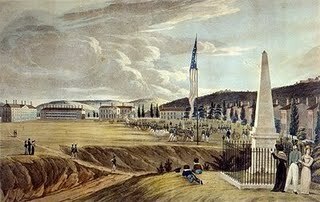 On July 1, 1830, Poe enrolled as a cadet officer at West Point. While enrolled at West Point, he published a third book of poems. The same thing happened to Poe at West Point as at the University of Charlottesville - John Allan didn't provide him with adequate funds. In January 1831 Poe wrote to Allan, "You sent me to W. Point like a beggar. The same difficulties are threatening me as before at Charlottesville - and I must resign" (Asselineau 8).